Apple takes pride in crafting really great products, but hardware isn’t much more than steel and wires without good software. When it comes down to email messaging, there’s a couple good clients around, but few of them are good enough to be called “great”: Outlook is one of them, and it works perfectly on OS X. It’s able to do anything you’d want it to… that is, if you don’t ask it to migrate your mails. See, there’s a problem with email clients: they are used to deal with the information going around, but storing them is another thing entirely. Migrating your mails from place to place often needs two things: one are the exported mail files, known in Outlook for Mac as . olm files. The other requirement, since the exported files are recognized only by its mother software, is a destination with the same client. Thus, migrating between softwares wasn’t even possible until very recently, when we came up with various products to convert some kinds of exported mail files into other kinds . One of those who you digged the most was OLM Converter Pro , a product designed to convert .olm files into those files recognised by Apple Mail, Thunderbird, Microsoft Entourage Archive 2004/2008, or PostBox. As great as that was, something was missing. Something crossed our minds: was there any way to improve its design? There was: by skipping the .olm step entirely. Hence , Outlook Mac Converter Ultimate was born. Outlook Mac Converter Ultimate needs no .olm files to process mail migration. Even though it does support conversion of olm files to other mail clients. Our improved version is now able to access your Outlook 2011 database directly, without added processes, saving you precious time in mail migration process. Exporting an . olm file often meant saying no to some of your calendars and contacts. Our new products takes them all into account, converting all calendars into ICAL files and contacts into VCF ones. Safety and accuracy are two traits most wanted in any migration process, but having to go through the .olm conversion process often meant giving up on those. Outlook Mac Converter Ultimate does not. Our product is still more than able to migrate those mails from Outlook on Mac 2011 to Microsoft Entourage Archive 2004/2008, Thunderbird or Apple Mail within minutes. Load, click, forget about it. Unicode content, foreign languages, double-byte characters, (japanese, chinese ) … all that can be a real nightmare for any migration software . Outlook Mac Converter Ultimate makes sure it all goes right. It’s fairly easy to lose your attachments while migrating your mails from client to client. Most products forget to take that into account, but ours keeps all your attached documents tight. Emails rarely come alone: they like to nest inside one another and make for complex hierarchies . Outlook Mac Converter Ultimate maintains all your nested hierarchies intact. What are the limitations of Outlook Mac Converter Ultimate Trial Version ? It’s a fully functional copy of the app and lets you experience the Outlook Mac Mail conversion process first hand. Only limitation is while exporting the converted data, the app exports only 10 mails each folder while using Trial version of our App. 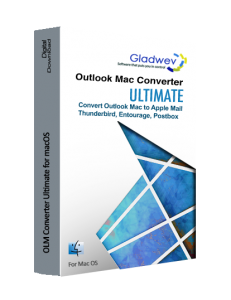 Gladwev Outlook Mac Converter Ultimate is the only app that works directly on Mac. You just run the app and it will detect the mails from Outlook Mac database identity and perform the conversion. You will get the output file which can be imported in the Mail client of your choice to get access to your mail data from Outlook Mac. Do I need to Wait for the Physical product to be shipped to start with Outlook Mac Mail conversion process ? No, not at all, our software is a Digital Download as we care for mother earth, the software can be downloaded instantly. You will receive a License key on your email address specified while placing the order with in 15 minutes. You are all set to proceed with conversion, after Activating your Outlook Mac Mail Converter Ultimate license.